Two Chinese-made toys for pets sold at Wal-Mart stores contain elevated levels of lead, chromium, and cadmium, according to a forensic toxicologist whose lab tested the products for ConsumerAffairs.com. Two veterinarians, however, said the levels of toxic metals found in the toys do not pose a health risk to dogs or cats. Whether the toys are a hazard to children and adults who handle them isn't clear. ConsumerAffairs.com hired ExperTox Analytical Laboratory in Texas to test four imported toys for pets -- two for dogs and two for cats -- for heavy metals and other toxins. 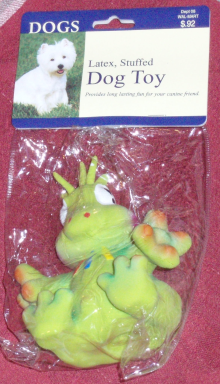 One of the dog toys -- a latex one that looks like a green monster -- tested positive for what the labs toxicologist said are high levels of lead and the cancer-producing agent chromium. A cloth catnip toy also tested positive for a tremendous amount of the toxic metal cadmium, the lab said. ExperTox also analyzed two other Chinese-made pet toys a cloth hedgehog for dogs and a plastic dumbbell toy for cats. The lab detected cadmium in those toys, but said the levels were about the amount youd find in one cigarette and not considered significant. ConsumerAffairs.com purchased the four pet toys earlier this month at a Wal-Mart store in Kansas City, Missouri. All the toys had a tag attached that read Marketed by Wal-Mart stores and Made in China. Forensic toxicologist Dr. Ernest Lykissa, Ph.D., director of ExperToxs lab, described the levels of heavy metals in the green monster and catnip toys as potentially toxic and said Wal-Mart should pull the products off the market. Or put a warning label on them that says if you put this (toy) in your mouth you will get poisoned, he said. There is nothing good about the agents (in these toys) that Im reporting to you. Lykissa said lead goes to the brain and causes learning disorders in children. Its also implicated in high instances of heart attacks. It is a very heavy metal. Chromium, he said, is a cancer producing agent. It can cause cancer in the bladder and kidneys, and if its inhaled, cause cancer in the lungs. Theres nothing good about chromium. And cadmium is a horrible thing to get into the body. It creates havoc in the joints, kidneys, and lungs. 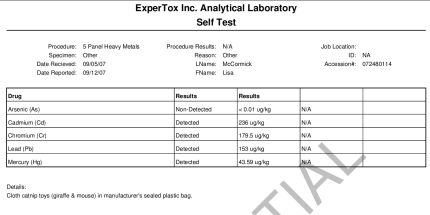 ExperToxs tests on the green monster toy detected what Lykissa said are elevated levels of lead -- 907.4 micrograms per kilogram. Thats almost one part per million. With that kind of concentration, if a dog is chewing on it or licking it, hes getting a good source of lead. The green monster toy also had what Lykissa considered high levels of chromium -- 334.9 micrograms per kilogram. With that kind of chromium in there you have what can be an extremely toxic toy if they (animals) put it in their mouths. And dogs put things in their mouths. If a dog puts this in his mouth, he runs a big chance of getting some type of metal toxicity that may shorten his life. Which heavy metal -- chromium or lead -- poses a bigger threat to dogs? Toxic burden is toxic burden, Lykissa said. You are increasing the burden on the animal by having these in there. A dog is going to get a good dose of chromium and lead from this toy. The lab also detected other toxic metals in the green monster toy. Theres cadmium, arsenic, and mercury in there, Lykissa said. This is not a clean toy. This is toxic. Bank on it. 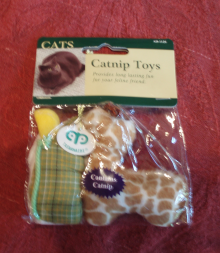 ExperToxs tests on the catnip toy detected concerning levels of cadmium 236 micrograms per kilogram. That one is worrisome to me, Lykissa said. Thats a big number. Its a good dose of cadmium. Theres another reason Lykissa is concerned about the heavy metals in these chew toys. These (toxic) materials came off the toys freely, like with the lick of the tongue from a dog or cat, he said. They were readily liberated from these toys. We didnt take a sledge hammer and pound on them. I just did what a dog or cat would do by licking it. Thats why this is so serious. Lykissa said toxicologists cut off a small piece from each of the toys, weighed the samples, and put them in acidic water. We left the samples for a while and then heated them up to body temperature, he said. Then we put them in a machine (called an ICP-MS -- or Inductively coupled plasma mass spectrometry), and that machine told us this is lead and this is chromium . . .
We didnt dissolve the toys, he added. These materials were leeching off the toys. Whatever leeched off the toys is what Im reporting to you. The material came right off. Somebodys saliva or the sweat in their hands would freely pick up these materials. And thats absorbing it. If you ate the materials, like a dog might, it would be worse. Lykissa said he wasnt surprised to find these levels of toxic materials in the toys. I knew where they came from China. And anything from there seems to be made using very old manufacturing processes that are ripe with these types of problems. Unfortunately, its becoming routine in my business to see these types of results (on products made in China). But we better be worried, he said of labs findings. Some of the toys you had were clean, like the hedgehog and the plastic dumbbell. They had small amounts of cadmium. But then you look at that catnip toy and it has 236 (micrograms per kilograms) of cadmium. Thats something that somebody out there ought to be worried about. In my business, if youre going to sit there and let dogs and cats play with a toy that has heavy metals freely released from it -- and put it in their mouths it becomes a concern. But veterinarians who reviewed ExperToxs results disagree. I dont see any of those numbers being a toxicity concern for dogs or cats, said Dr. Mike Murphy of the University of Minnesotas College of Veterinary Medicine. Latex paint can contain one-half to one percent of lead, which is 10,000 parts per million. What he (Dr. Lykissa) is saying is that one part per million is a risk. But latex paint is 10,000 times higher than that and we dont recognize latex paint as a toxicity risk to dogs and cats. I disagree with the interpretation thats being made (by Lykissa), added Dr. Murphy, who holds a Ph.D. in toxicology. I consider these to be extremely low numbers and they are not a toxicological concern for pet owners. Dr. Fred Oehme at Kansas State Universitys College of Veterinary Medicine said the risks to dogs and cats from these toys depends on how much of the heavy metals are absorbed in their bodies. Could they be harmful? The poisoning depends on how much is taken into their systems. Most animals require 30 parts per million of their total daily diet before you get into a problem with lead. Cadmium is more than that. Should pet owners be wary of these toys? I think theyre a potential hazard just like a car can be a potential hazard, said Dr. Oehme, a professor of toxicology, pathobiology, medicine, and physiology. The hazard in this case implies how the compound is being used and its availability. 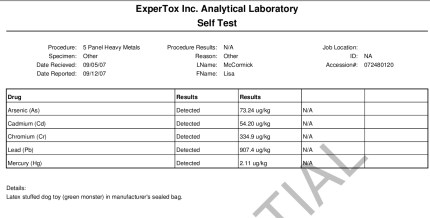 Im more concerned about the lead than the other two (heavy metals), he added. Lead accumulates and if it gets into the body, it builds up. ConsumerAffairs.com contacted Wal-Mart about ExperToxs findings, but the company did not respond. We also shared the labs findings with the Food and Drug Administration (FDA). A spokeswoman said the FDA does not regulate toys for pets, and she is not aware of any governmental agency with regulatory power over these products. What about the Consumer Product Safety Commission (CPSC)? Although its not in the fine print, the CPSC will regulate pet toys as they assume those toys would come in contact with children, according to a spokeswoman for the American Pet Product Manufacturers Association (APPMA). We shared ExperToxs test results with APPMA -- a non-profit trade group that represents more than 900 pet product makers. The groups president, however, was traveling last week and unavailable for comment. We also contacted the CPSC, but the agency did not respond to our inquiry. Meanwhile, pet owner Doris B. told us shes horrified by ExperToxs results even though she doesnt have a dog or cat. Her pet is a ferret. These lab results are very disturbing, said the Columbus, Georgia, woman. If I had a dog or cat, I would be mad as H-E-L-L.
Doris first contacted us in late August with concerns about possible toxins in pet toys. There is a lot of public outcry (and rightly so) over the Menu Foods and Mattel toy recalls, she told us. One overlooked area is the pet toy industry. It seems like every cat toy, dog toy, etc. says made in China. Has anyone tested these things to see if they are safe for our pets to chew? We did about two weeks later. And ExperToxs test results didnt surprise Doris. I had a sneaking suspicion this was the way it was going to come down, she said. Weve had these pet food recalls and the (melamine-tainted) ingredients came from China. And the childrens toys that have been recalled were also made in China. But pet owners shouldnt be the only ones alarmed by ExperToxs findings, Doris said. Parents should be worried, too. There are children playing with their pets and their pets toys, she said, and sometimes small children will put their pets toys in their mouths. Somebody ought to care enough to do something about this.